The last detail of this multi coloured yoke was done in light green thread. 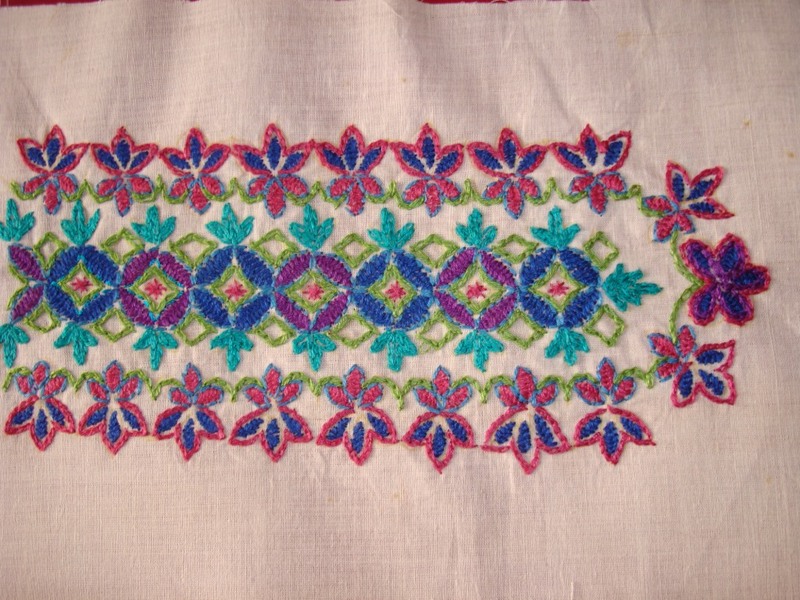 The centre, the other details of the original pattern were worked in chain stitches with this colour. With this the yoke is completed. 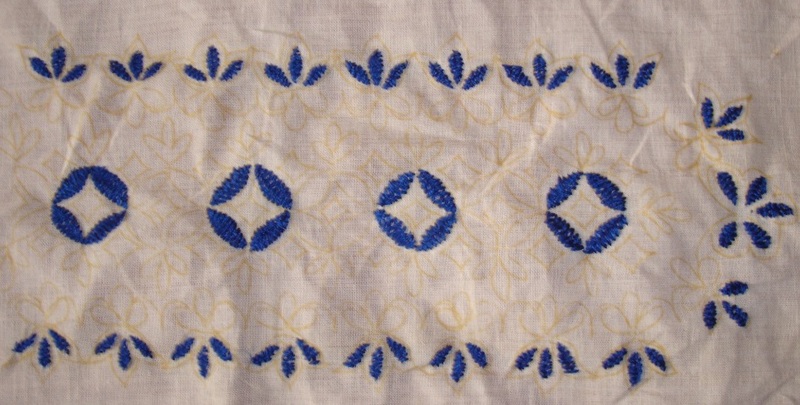 A friend had a grey, cream and blue kalamkari fabric. the fabric looked dull to her, so she wanted a yoke done in cream fabric to brighten that kalamkari. She did not want any mirrors or embellishments. With these options, I drew the pattern and chose these colours. I gave this finished yoke to her, but haven’t seen, how it was used by her. This pattern goes well with mirrors, if someone is interested can try this with mirrors, that was the reason , I had posted the pattern for this yoke. 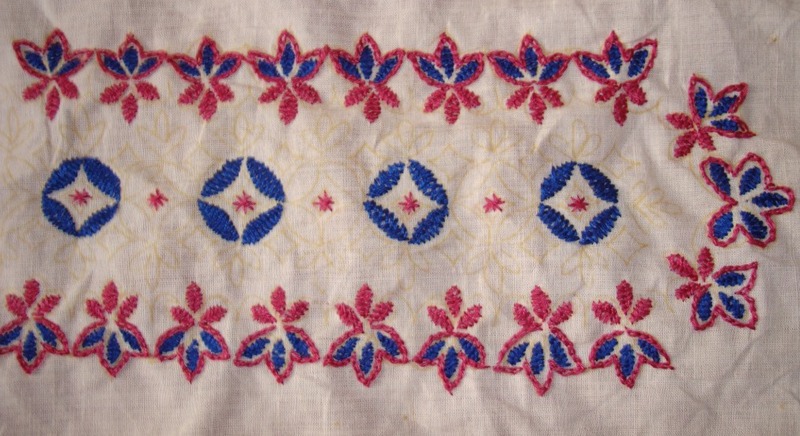 This yoke is embroidered with different stitches and assorted colours. After working with dark blue and dark pink, the next thread colour was majenta . herring bone filling stitches were worked with this thread in the central part of the yoke. 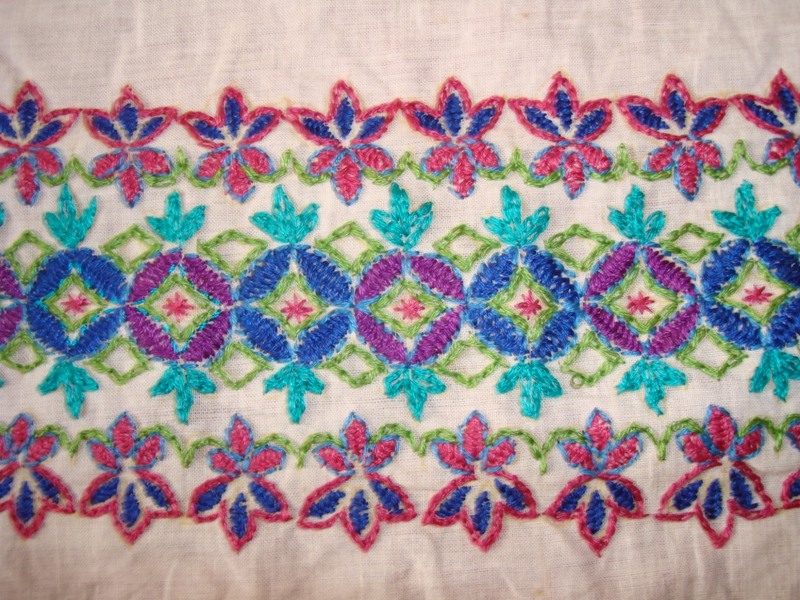 The herring bone filling are outlined in back stitch with light blue colour thread. The next colour, was bluish green, chain stitches were worked with this thread. The last detail and completed yoke on my next post. This is a medium sized yoke in multi colours. The inspiration for this pattern was from Ethnic Indian design. 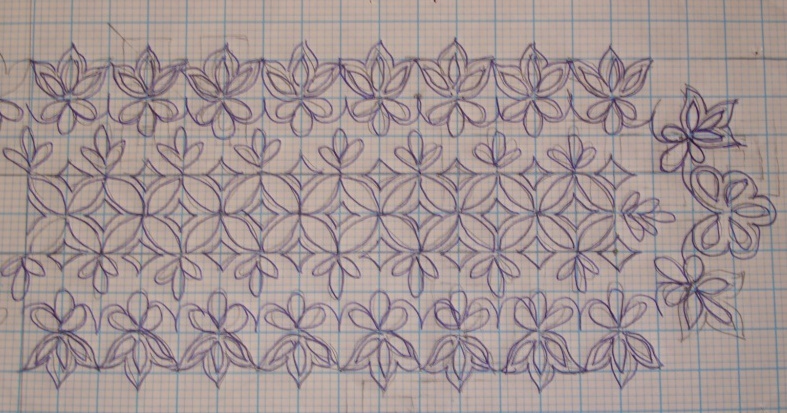 Generally this design is worked with mirrorwork and a variety of other stitches. In this particular yoke , I did not use mirrors. Double cross stitches and chain stitch outlines and more herringbone filling done in dark pink. More details of this yoke on my next post.